For information about the World War II battle, see Battle of Monte Cassino. The history of Monte Cassino is linked to the nearby town of Cassino which was first settled in the fifth century B.C. by the Volsci people who held much of central and southern Italy. It was the Volsci who first built a citadel on the summit of Monte Cassino. The Volsci in the area were defeated by the Romans in 312 B.C. The Romans renamed the settlement Casinum and built a temple to Apollo at the citadel. Modern excavations have found no remains of the temple, but ruins of an amphitheatre, a theatre, and a mausoleum indicate the lasting presence the Romans had there. Generations after the Roman Empire adopted Christianity the town became the seat of a bishopric in the fifth century A.D. Lacking strong defences the area was subject to barbarian attack and became abandoned and neglected with only a few struggling inhabitants holding out. According to Gregory the Great's biography of Benedict, Life of Saint Benedict of Nursia, the monastery was constructed on an older pagan site, a temple of Apollo that crowned the hill. The biography records that the area was still largely pagan at the time; Benedict's first act was to smash the sculpture of Apollo and destroy the altar. He then reused the temple, dedicating it to Saint Martin, and built another chapel on the site of the altar dedicated to Saint John the Baptist. "Now the citadel called Casinum is located on the side of a high mountain. The mountain shelters this citadel on a broad bench. Then it rises three miles above it as if its peak tended toward heaven. There was an ancient temple there in which Apollo used to be worshipped according to the old pagan rite by the foolish local farmers. Around it had grown up a grove dedicated to demon worship, where even at that time a wild crowd still devoted themselves to unholy sacrifices. When [Benedict] the man of God arrived, he smashed the idol, overturned the altar and cut down the grove of trees. He built a chapel dedicated to St. Martin in the temple of Apollo and another to St. John where the altar of Apollo had stood. And he summoned the people of the district to the faith by his unceasing preaching." Pope Gregory I's biography of Benedict claims that Satan opposed the monks repurposing the site. In one story, Satan invisibly sits on a rock making it too heavy to remove until Benedict drives him off. In another story, Satan taunts Benedict and then collapses a wall on a young monk, who is brought back to life by Benedict. Pope Gregory also relays that the monks found a pagan idol of bronze when digging at the site (which when thrown into the kitchen gave the illusion of a fire until dispelled by Benedict). Archaeologist Neil Christie notes that it was common in such hagiographies for the protagonist to encounter areas of strong paganism. Benedict scholar Terrence Kardong examines why Benedict did not face stiffer opposition in his seizure of the site from the local pagans. He contrasts this with the 25-year struggle faced by St. Martin of Tours in western Gaul by pagans angry at his attacks on their shrines: "By the time of Benedict, paganism was in a weaker condition in western Europe than it had been in Martin's time. And, of course, it must be remembered that Martin as a bishop was a much more prominent churchman than Benedict. This was an isolated and unusual episode in Benedict's monastic career. Martin, however, was thrust out of his monastery into the role of a missionary bishop in the fourth century." Benedict scholars (such as Adalbert de Vogüé and Terrence Kardong) note the heavy influence of Sulpicius Severus' Life of Martin on Pope Gregory I's biography of Benedict, including the account of his seizure of Monte Cassino. Benedict's violence against a pagan holy place recalls both Martin's assault against pagan shrines generations before and the Biblical story of conquering Israel entering the Holy Land (see Exodus 34:12-14). De Vogue writes "this mountain had to be conquered from an idolatrous people and purified from its devilish horrors. And like conquering Israel, Benedict came precisely to carry out this purification. No doubt Gregory had this biblical model uppermost in his mind, as is clear from the terms he uses to describe the work of destruction. At the same time, neither Gregory nor Benedict could have forgotten the similar line of action taken by St. Martin against the pagan shrines of Gaul." Pope Gregory I's account of Benedict at Monte Cassino is seen by scholars as the final setting for an epic set in motion at Subiaco. In his earlier setting Benedict "had twice shown complete mastery over his aggressiveness, Benedict is now allowed to use it without restraint in the service of God." Scholars note that this striking contrast is not stressed by Gregory but rather both settings are portrayed as part of a single battle account against the same demonic enemy. Where Satan concealed himself behind underlings at Subiaco, at Monte Cassino he drops the masks to enter into a desperate attempt to prevent an abbey from being built, and "that the sole cause of this eruption of satanic action is the suppression of pagan worship on the high places." While scholars see some similarities between the story of Benedict's encountering demonic phenomena and diabolic apparitions at Monte Cassino with the story of Saint Anthony the Great's temptation in the desert, the influence of the story of St. Martin is dominant — with the resistance of Satan substituting for Martin's outraged pagan populace. Unlike the stories that may have influenced Pope Gregory's structure of the biography, Benedict's victories are practical, preventing Satan from stopping work on the abbey at Monte Cassino. Benedict's prayers are portrayed as the driving force behind the building of the abbey and the triumphs over Satan, through prayer "Benedict the monk wrests from the devil a well-determined base which he never leaves." After the completion of the abbey, Satan's appearances in the story diminish back to the same level as Subiaco, "Only after the saint's death and by God's permission would other enemies, the Lombards, succeed in sacking it." Once established at Monte Cassino, Benedict never left. He wrote the Benedictine Rule that became the founding principle for Western monasticism, received a visit from Totila, king of the Ostrogoths (perhaps in 543, the only remotely secure historical date for Benedict), and died there. According to accounts, "Benedict died in the oratory of St. Martin, and was buried in the oratory of St. John." The Rule of St. Benedict mandated the moral obligations to care for the sick. So in Monte Cassino St. Benedict founded a hospital that is considered today to have been the first in Europe of the new era. Benedictine monks took care of the sick and wounded there according to Benedict’s Rule. The monastic routine called for hard work. The care of the sick was such an important duty that those caring for them were enjoined to act as if they served Christ directly. Benedict founded twelve communities for monks at nearby Subiaco (about 64 km to the east of Rome), where hospitals were settled, too, as adjuncts to the monasteries to provide charity. Soon many monasteries were founded throughout Europe, and everywhere there were hospitals like those in Monte Cassino. Pope Gregory I's account of Benedict's construction was confirmed by archaeological discoveries made after the destruction of 1944. Adalbert de Vogüé recounts that "Traces have been found of the oratories of St. Martin and of St. John the Baptist, with additions from the eighth and eleventh centuries, together with their pre-Christian cellars. The first one which Benedict built in the temple itself was only twelve meters long and eight wide. From this, we can infer a fairly small community. The second oratory, on the mountain-top, where the pagan altar had stood in the open air, was of the same width but somewhat longer (15.25 meters)." Monte Cassino became a model for future developments. Its prominent site has always made it an object of strategic importance. It was sacked or destroyed a number of times. "The first to demolish it were Lombards on foot in 580; the last were Allied bombers in 1944." In 581, during the abbacy of Bonitus, the Lombards sacked the abbey, and the surviving monks fled to Rome, where they remained for more than a century. During this time the body of St Benedict was transferred to Fleury, the modern Saint-Benoit-sur-Loire near Orleans, France. A flourishing period of Monte Cassino followed its re-establishment in 718 by Abbot Petronax, when among the monks were Carloman, son of Charles Martel; Ratchis, predecessor of the great Lombard Duke and King Aistulf; and Paul the Deacon, the historian of the Lombards. In 744, a donation of Gisulf II of Benevento created the Terra Sancti Benedicti, the secular lands of the abbacy, which were subject to the abbot and nobody else save the Pope. Thus, the monastery became the capital of a state comprising a compact and strategic region between the Lombard principality of Benevento and the Byzantine city-states of the coast (Naples, Gaeta, and Amalfi). In 884 Saracens sacked and then burned it down, and Abbot Bertharius was killed during the attack. Among the great historians who worked at the monastery, in this period there is Erchempert, whose Historia Langobardorum Beneventanorum is a fundamental chronicle of the ninth-century Mezzogiorno. Monte Cassino was rebuilt and reached the apex of its fame in the 11th century under the abbot Desiderius (abbot 1058–1087), who later became Pope Victor III. Monks caring for the patients in Monte Cassino constantly needed new medical knowledge. So they began to buy and collect medical and other books by Greek, Roman, Islamic, Egyptian, European, Jewish, and Oriental authors. As Naples is situated on the crossroad of many seaways of Europe, Middle East and Asia, soon the monastery library was one of the richest in Europe. All the knowledge of the civilizations of all the times and nations was accumulated in the Abbey of that time. The Benedictines translated into Latin and transcribed precious manuscripts. The number of monks rose to over two hundred, and the library, the manuscripts produced in the scriptorium and the school of manuscript illuminators became famous throughout the West. The unique Beneventan script flourished there during Desiderius' abbacy. Monks reading and copying the medical texts learnt a lot about human anatomy and methods of treatment, and then put their theoretic skills into practice at monastery hospital. By the 10-11th centuries Monte Cassino became the most famous cultural, educational, and medical center of Europe with great library in Medicine and other sciences. Many physicians came there for medical and other knowledge. That is why the first High Medical School in the world was soon opened in nearby Salerno which is considered today the first Institution of Higher Education in the world. This school found its original base in the Benedictine Abbey of Monte Cassino still in the 9th century and later settled down in Salerno. So, Montecassino and Benedictines played a great role in the progress of medicine and science in the Middle Ages, and with his life and work St. Benedict himself exercised a fundamental influence on the development of European civilization and culture and helped Europe to emerge from the "dark night of history" that followed the fall of the Roman empire. The buildings of the monastery were reconstructed in the 11th century on a scale of great magnificence, artists being brought from Amalfi, Lombardy, and even Constantinople to supervise the various works. The abbey church, rebuilt and decorated with the utmost splendor, was consecrated in 1071 by Pope Alexander II. A detailed account of the abbey at this date exists in the Chronica monasterii Cassinensis by Leo of Ostia and Amatus of Monte Cassino gives us our best source on the early Normans in the south. Abbot Desiderius sent envoys to Constantinople some time after 1066 to hire expert Byzantine mosaicists for the decoration of the rebuilt abbey church. According to chronicler Leo of Ostia the Greek artists decorated the apse, the arch and the vestibule of the basilica. Their work was admired by contemporaries but was totally destroyed in later centuries except two fragments depicting greyhounds (now in the Monte Cassino Museum). "The abbot in his wisdom decided that great number of young monks in the monastery should be thoroughly initiated in these arts" - says the chronicler about the role of the Greeks in the revival of mosaic art in medieval Italy. Architectural historian Kenneth John Conant believed that Desiderius' rebuilding included pointed arches, and served as a major influence in the nascent development of Gothic architecture. Abbot Hugh of Cluny visited Monte Cassino in 1083, and five years later he began to build the third church at Cluny Abbey, which then included pointed arches and became a major turning point in medieval architecture. An earthquake damaged the Abbey in 1349, and although the site was rebuilt it marked the beginning of a long period of decline. In 1321, Pope John XXII made the church of Monte Cassino a cathedral, and the carefully preserved independence of the monastery from episcopal interference was at an end. That situation was reversed by Pope Urban V, a Benedictine, in 1367. In 1505 the monastery was joined with that of St. Justina of Padua. The site was sacked by Napoleon's troops in 1799. From the dissolution of the Italian monasteries in 1866, Monte Cassino became a national monument. 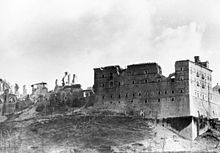 During the Battle of Monte Cassino in the Italian Campaign of World War II (January–May 1944) the Abbey was heavily damaged. The German military forces had established the 161-kilometre (100-mile) Gustav Line, in order to prevent Allied troops from advancing northwards. The abbey itself however, was not initially utilised by the German troops as part of their fortifications, owing to General Kesselring's regard for the historical monument. The Gustav Line stretched from the Tyrrhenian to the Adriatic coast in the east, with Monte Cassino itself overlooking Highway 6 and blocking the path to Rome. On 15 February 1944 the abbey was almost completely destroyed in a series of heavy American-led air raids. The Commander-in-Chief Allied Armies in Italy, General Sir Harold Alexander of the British army ordered the bombing. The bombing was conducted because many reports from the British commanders of the Indian troops on the ground suggested that Germans were occupying the monastery, and it was considered a key observational post by all those who were fighting in the field. However, during the bombing no Germans were present in the abbey. Subsequent investigations found that the only people killed in the monastery by the bombing were 230 Italian civilians seeking refuge there. Following the bombing the ruins of the monastery were occupied by German Fallschirmjäger (paratroopers) of the 1st Parachute Division, because the ruins provided excellent defensive cover. The Abbey was rebuilt after the war. In the early 1950s, President of the Italian Republic Luigi Einaudi gave considerable support to the rebuilding. Pope Paul VI consecrated the rebuilt Basilica on October 24, 1964. During reconstruction, the abbey library was housed at the Pontifical Abbey of St Jerome-in-the-City. Until his resignation was accepted by Pope Francis on 12 June 2013, the Territorial Abbot of Monte Cassino was Pietro Vittorelli. The Vatican daily bulletin of 23 October 2014 announced that with the appointment of his successor Donato Ogliari, the territory of the abbey outside the immediate monastery grounds had been transferred to the Diocese of Sora-Aquino-Pontecorvo, now renamed Diocese of Sora-Cassino-Aquino-Pontecorvo. In December 1943, some 1,400 irreplaceable manuscript codices, chiefly patristic and historical, in addition to a vast number of documents relating to the history of the abbey and the collections of the Keats-Shelley Memorial House in Rome, had been sent to the abbey archives for safekeeping. German officers Lt. Col. Julius Schlegel (a Roman Catholic) and Capt. Maximilian Becker (a Protestant), both from the Panzer-Division Hermann Göring, had them transferred to the Vatican at the beginning of the battle. Another account, however, from Kurowski ("The History of the Fallschirmpanzerkorps Hermann Göring: Soldiers of the Reichsmarschall"), notes that 120 trucks were loaded with monastic assets and art which had been stored there for safekeeping. Robert Edsel ("Rescuing DaVinci") is more to the point about German looting. The trucks were loaded and left in October 1943, and only "strenuous" protests resulted in their delivery to the Vatican, minus the 15 cases which contained the property of the Capodimonte Museum in Naples. Edsel goes on to note that these cases had been delivered to Göring in December 1943, for "his birthday." ^ "Catholica Ecclesia". Holy See. ^ "Vatican announces reorganisation of Montecassino Abbey". Vatican Radio. October 23, 2014. ^ "Vatican reorganizes Montecassino, mother abbey of the Benedictines". Catholic News Agency. October 24, 2014. ^ a b by Trudy Ring; Robert M. Salkin; Sharon La Boda, eds. (1995). International Dictionary of Historic Places: Volume 3 Southern Europe. Chicago, IL: Fitzroy Dearborn Publishers. p. 132. ^ a b Pope Gregory I (2009). The Life of Saint Benedict. Translated by Terrence Kardong, OSB. Collegeville, MN: Liturgical Press. ^ a b c d e f g Gregory the Great (1993). The Life of St. Benedict. Translated by Hilary Costello and Eoin de Bhaldraithe. Commentary by Adalbert de Vogüé. Petersham, MA: St. Bede's Publications. ^ Fremantle, Anne (1965). The Age of Faith. Time-Life Books. p. 34. ISBN 978-0652686104. ^ Durant, Will (1950). The Age of Faith: A History of Medieval Civilization - Christian, Islamic, and Judaic - from Constantine to Dante: A.D. 325-1300. Simon and Schuster. p. 290. ^ Tomassetti, Aloysius, ed. (1859). Bullarum, diplomatum et privilegiorum sanctorum romanorum pontificum Taurinensis editio (in Latin) (Tomus IV ed.). Turin: Seb. Franco et Henrico Dalmazzo editoribus. pp. 522–523. ^ "When I Landed the War Was over", by Hughes Rudd, American Heritage, October/November 1981. ^ Bloch, Herbert (1986). Monte Cassino in the Middle Ages. 1. Cambridge, MA: Harvard University Press. p. xix. ISBN 0674586557. ^ "Pontifical Acts - 12 June". News.va. 12 June 2013. Retrieved 22 May 2016. ^ "Pontifical Acts - 23 October". News.va. 23 October 2014. Retrieved 22 May 2016. Atkinson, Rick (2007). The Day of Battle: the War in Sicily and Italy, 1943-1944. New York: Henry Holt. ISBN 978-0-8050-6289-2. Bloch, Herbert (1986). Monte Cassino in the Middle Ages. 1. Roma: Edizioni di Storia e Letteratura. Hapgood, David; Richardson, David (2002) . Monte Cassino: The Story of the Most Controversial Battle of World War II (reprint ed.). Cambridge Mass. : Da Capo. ISBN 0-306-81121-9. Wikimedia Commons has media related to Monte Cassino.